I am a little reluctant to admit that our Ikea Expedit bookcase has changed rooms a staggering four times in our home. I guess it’s a testament to how versatile it is as a piece of furniture (or maybe it’s the fact that I love to “re-do” rooms). 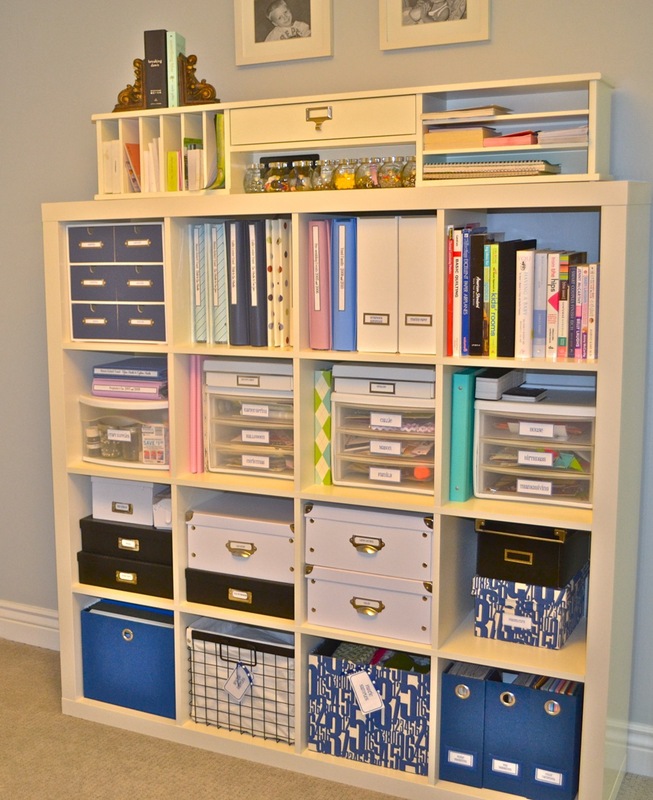 Let’s review where the Expedit has been and the purpose it has served in each space. My son’s bed doesn’t have a headboard so I put the Expedit behind the bed for additional storage. Please excuse this picture, I guess I never took a photo of the bookcase styled and the bed made. I snapped this shot just before the Expedit’s fourth move. This photo provides a sneak peak at some of the changes in Mason’s room. We bought him a loft bed from Ikea to go over his queen but it was too tall for our standard height ceilings and thus we had to cut it down. 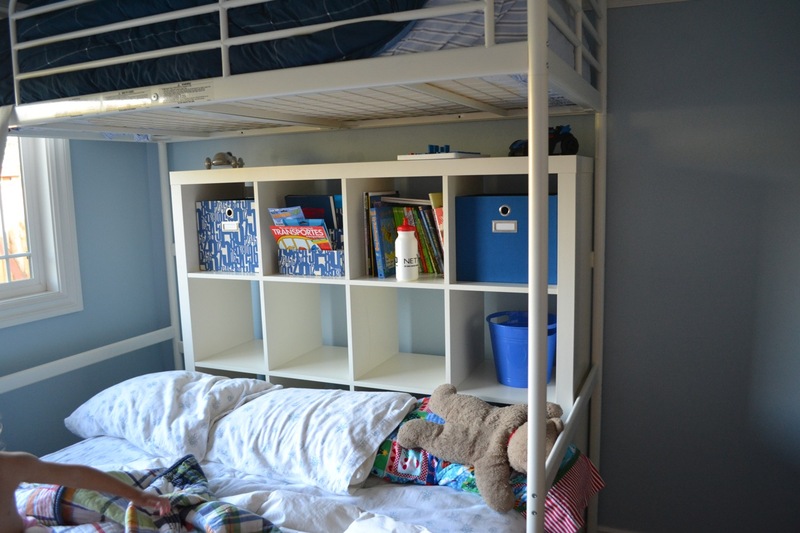 The bookcase would no longer fit under the loft bed (more on that later). Hi! 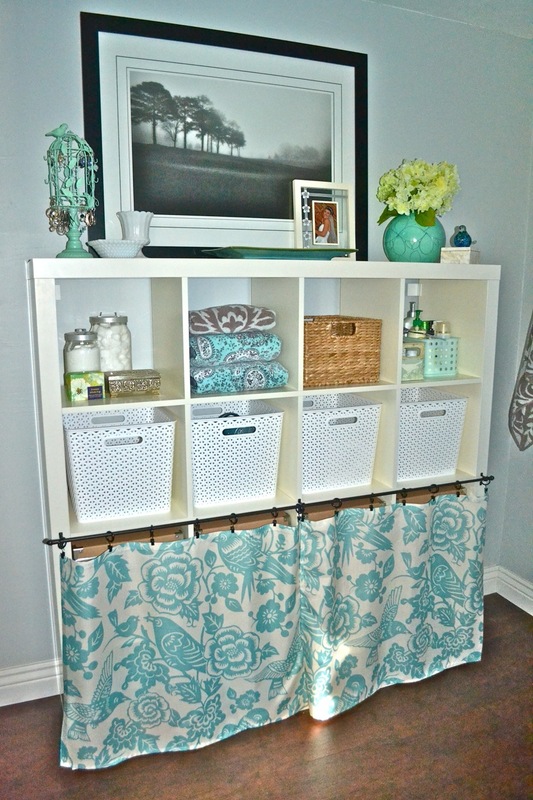 Stumbled across your post/site on Pinterest while looking for ideas of Expedit shelving with a curtain rod attached. You were, surprisingly, the only one I could find online. 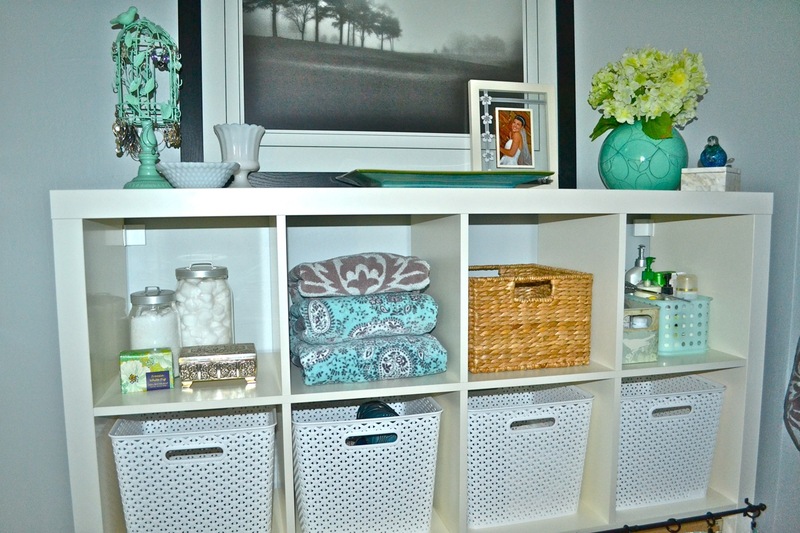 Anyways, love the look of the curtain rod on your shelving! I have the smaller four cube expedit in my daughter’s room that has a gerbil cage on top and the baskets underneath hold food/accessories as well as her craft items. I wanted to put a café rod and curtain to keep the cedar chips from falling into the cube baskets and making a mess. I think put a curtain up would help with that. My concern is will I be able to easily drill into the shelving to add the curtain rod? Can you tell me anything that I should be aware of before doing this? Tips/Advice? Also, how has the curtain rod held up since you attached it? Thanks for any suggestions or advice you can give! Thank you for your comment. It is very easy to drill into the Expedit. We predrilled holes using a very small bit and then screwed in the curtain hardware by hand. The curtain rod has held up great. The Expedit is now in my son’s room and the curtain became a nuisance for him so we took it off. The hardware is still attached, we only removed the fabric curtain. I would measure really well before you drill as you want to make sure the rod hangs level with the shelves. Best of luck! I, too, came across your site via Pinterest. I was interested in your organization boxes in the second picture from the top. 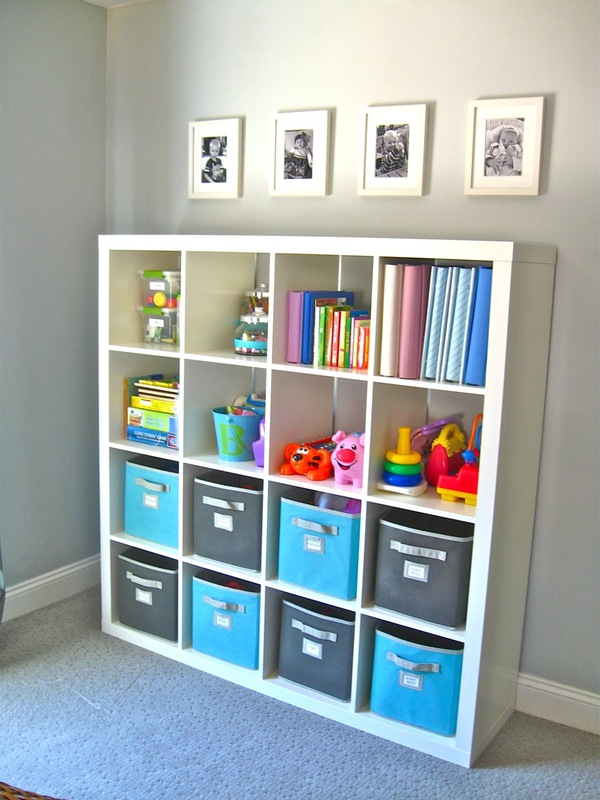 Specifically, the blue drawers in the top left(facing the pic) cubbie. I know it’s been a while since you posted, so here’s hoping you’ll see this! Merry Christmas! Hello! Merry Christmas to you as well. The cubbies you are referring to are from Ikea and were purchased many many years ago. It was raw wood that I painted blue and added label plates to. Unfortunately, I don’t think they carry them anymore. Thank you for your comment.